Dental fillings allow repairing lesions created by tooth decay. They can also give the tooth shape and function in case of worse damage or fracture. There are many materials available to restore a decayed tooth. The choice of the ideal material is done according to the location, extent of the cavity, cost of repair, and the dentist’s recommendation. Amalgam is a basic material that has been used to repair decayed teeth for over 100 years. It consists of a metallic alloy of silver, copper, tin, and mercury. Amalgam fillings can be unadvised by many dentists because of the content of mercury, a metal that can be toxic though it is present in a very small quantity in the alloy. Durability (10 to 15 years). Solidity (can resist the chewing forces). Cost (they are the least expensive permanent restorations). Poor aesthetics (the grey colour does not go well with the ivory colour of teeth). Destruction of tooth matter (more space is needed in the cavity for a silver filling to hold well). Discolouration (grey fillings can create a grayish tint on the teeth). 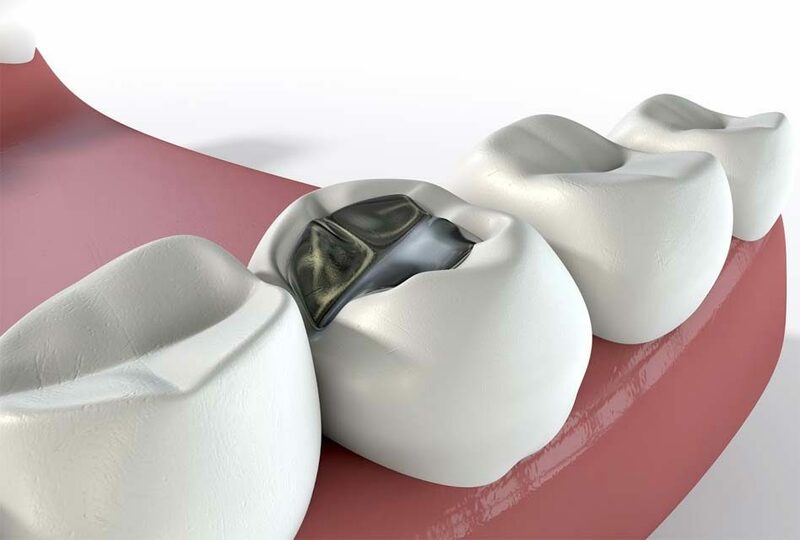 Cracks and fractures (amalgam fillings tend to expand and contract during temperature changes in the mouth, much more than the teeth or the other restorative materials do. This can fracture a restored tooth). Allergic reactions (about 1% of the population is allergic to the mercury present in sliver fillings). Composites are materials in the shape of paste containing particles of quartz, silicate, and zirconium. They are very aesthetic and allow invisible restorations thanks to a multitude of shades. Initially used for the anterior teeth, the focus on more resistance to wear has allowed their use to restore posterior teeth as well. Improved aesthetics (the colour of composite can be identical to the colour of a tooth). Solid bond with the tooth (the composite is chemically bonded to the tooth, offering it a better support). Versatile usage (in addition to being a restorative material, composite can also be used to repair fractured or worn down teeth). 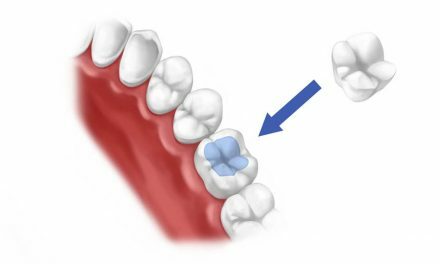 Less destruction to tooth matter (during the repair less tooth structure must be removed for the restorations done in composite compared to those done in amalgam). Less durable than silver fillings (seven to ten years). Cost (composite restorations are slightly more expensive that the amalgam ones). Durability (they are the fillings that last the longest, at least 15 years if they are well maintained). Solidity (they can resist top chewing forces). Aesthetics (some people find gold more appealing than silver fillings). Cost (a lot more expensive than composite or amalgam fillings). Sometimes require many visits to the dentist. Galvanic shock (it’s a rare occurrence, when a gold filling is placed next to an amalgam filling, the interaction between the metals and the saliva can cause an electric current and a sharp pain). Aesthetics (some people don’t find that gold is appealing on their teeth). Porcelain inlays and onlays are more aesthetic than composite and resist more to stains, though they are more abrasive. This material last longer, at least 15 years, and cost as much as the gold fillings. Glass ionomer is a mixture of acrylic and a specific type of glass material. It can be used to restore teeth that are decayed under the gum line, or on primary teeth. Glass ionomer releases fluoride, which protects the tooth from further decay. However, this material is weaker than composite and is more susceptible to fracture. Its lifespan is less than five years. For restorations that require more than one appointment, for example for gold or porcelain inlays. In the case where the pulp is partially irritated and a permanent filling cannot be done right away. As their name states, temporary restorations do not last a long time, from a few weeks to a few months. It is important not to stay with a temporary filling longer than three months to avoid infecting the tooth it is placed in or having other complications. The dentist must first proceed to the local anesthesia of the area where the tooth is located. He then removes the cavity by drilling. He can also use air abrasion or laser if the cavity is very small. Once there is no more cavity left and the tooth is clean of the bacterial debris, the dentist can place a glass ionomer base or another material, if the cavity is deep. The restorative material is then placed in the cavity. If it is composite, a blue light is applied on the tooth for a few seconds to harden the filling, and this is done in many layers. The filling is then adjusted according to the other teeth, and is finalized with a polishing. Brushing the teeth after each meal. Flossing at least once a day. Visiting the dentist for routine exams. The dentist checks to make sure that the fillings are not cracked, and the seal with the teeth is not broken. By taking x-rays, the dentist can also make sure that there are no cavities newly formed underneath the fillings. The price depends in the size of the cavity and the material used to restore it. Restorations cost between 80$ and 1,300$, and this can vary depending on which part of the country we live in. The information above should be used as a reference only. Any medical decision should not be taken before consulting a health care professional. The masculine gender may have been more used in the article, but without prejudice, to make reading easier. Dr. Anto Youssef has been active in the dental field for the past two decades. A dentist by day and a blogger by night, he may express his passion for dentistry by taking care of his patients, or by writing articles to inform the public about current dental topics. He is located in the lovely city of Montreal, and its neighbouring regions. Thank you Alex. The videos I post on Facebook are done from dentists of all around the world, not just me. Myself I am in Montreal, Canada. Sir I wish you could fix my teeths l have dentures but they not working very good I’m always biting my inside lips with them. 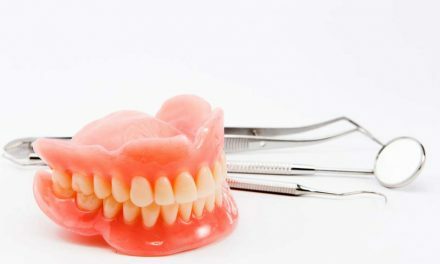 What can you advise me to do are there better dentures then the one I have? Hello Junior, I think the best way to give you an answer to the question you are asking, is for a dentist (me or anyone else) to see you in person. Thank you very much Zina! I am located in Canada. Hi,doctor where in Canada ? Yes we do implants in the clinics where I work. It is very hard to give a price without an exam. 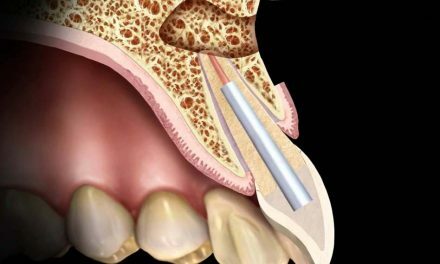 As placing an implant requires planning and possible side treatments as bone grafts. The cost, in Canadian dollars, is roughly between 3,500 and 6,000 dollars if we include the crown. Hello Jerome, no I am in Canada. Hello Dexter, I am in Canada. Hi Elizabeth, many dentists can do such white fillings. Maybe you can show the video to your dentist and ask if they use the same technique. I love how you crafted the front tooth – my 16 year old daughter needs this done. Quick question : is a tooth that has a root canal ok to mend like your video ? Is it easy enough to take the old composite off ? Quick question : would you treat an Australian tourist ? If so, can you give an indication of cost ? Hello Kathryn, and thank you so much for your feedback. I must point out that the video you are probably referring to was actually done by a dentist in Brazil. But many dentists from around the world can do this technique, and I am sure there are lots of talented dentists in Australia that you can find. As for your other questions, yes old composite can be removed. And if a tooth has a root canal, in most cases it is better to place a dental crown on it to keep its structure and prevent fractures. Interesting as I love Miami! Why those repeated questions, why dont you read other peoples comments then you would have your answer. If you can afford to travel to Canada from UK for treatment that wasn’t actually done by the dentist in Canada, you should be able to afford a Harley Street dentist who can probably do the same work. Research is all you need. Hi im in scotland are they clinics in scotkand ? Hi Shenaz, I am not affiliated to any dental clinic in Scotland, but I am sure there are lots of good ones! Hello Dr.my 3 years old granddaughter has cavities on all her teeth. All front ones are kind of black, we took her to a dentist , but we are scared they said they have to put her to sleep to do all the work at once , my daughter doesn’t want yo take her any more because she saw the news that one little girl died because of the same situation. Do you think she’s to little for that kind of treatment? Or do you have any other recommendation ? I think if your granddaughter has those cavities, it is urgent to repair them as soon as possible, because the cavities are destroying her teeth and infecting her mouth. It is also very important to improve her dental hygiene (brushing and flossing), and drastically reduce anything that has sugar in her diet. To repair her cavities, a dentist can proceed with local anaesthesia (needle injection). This can work if the child complies well. The older a child is, the more it is possible that he or she will comply well. Your grandaughter is only 3 years old. The other possibility that works very well is general anaesthesia (put her to sleep). The advantage is that all her cavities are repaired at the same time. The story about the little girl that dies while doing general anaesthesia is very very tragic, but also very unique. It is very rare that something horrible like that happens. I recommend that you ask more the dentist about the risks with each anaesthesia possibility, but you must proceed fast for your granddaughter’s teeth. Hey I really need some work done I’ve been like this my whole life it’s about time for a big change I would really appreciate if you can help me. You are very kind to seek my help. I am in Montreal, Canada. Where’s this ? Or where are your address ? Hello Wilma, I am in Canada (Montreal). Hi Dr. I’m from Lima, Peru. Are there any clinics near here? Hello Luis, I don’t personally know any dentists in Lima or all of Peru, even if I am sure there are good ones. But sorry as I don’t know any. War about dies in UK ? Hello Bev, I am in Montreal, Canada. Thank you for sharing this extensive information regarding the different types of filling options available to those in need of tooth repair. I also appreciate that you mention both the pros and cons of each option. While it is best to discuss all of these options with your dentist, since each individual case is different, it is also good to go into a dental appointment informed. Thanks again for sharing. I am sure your readers will benefit the next time they are having tooth problems. Hello Vivek, I am in a small and beautiful city called Vaudreuil. It is close to Montreal. El costo de un embaste dental depende de qué tan grande es y de qué material se utiliza. También el costo depende del país donde trabaja el dentista. Hello Sweet Saha, myself I am in Canada. When can you eat and drink after a tooth filling? Can you drink alcohol after tooth extraction? How soon after tooth extraction can you use a straw? How long does the numbing last after a dentist appointment? When can you smoke after a tooth extraction? When do dissolvable stitches fall out after wisdom teeth extraction? Which is better retainers or braces? How long does it bleed after wisdom teeth extraction? 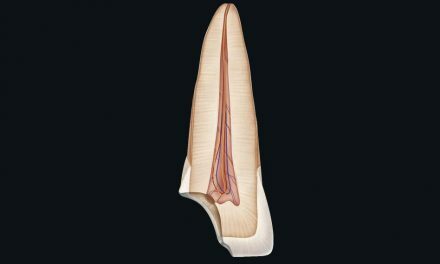 Where does a tooth go after extraction? Electric or regular, which toothbrush is better?